In 1911, the First International Hygiene Exhibition in Dresden opened its doors. Its five million visitors were a testimony to its success. Making use of modern exhibition technology, the show disseminated information about human anatomy, health care, and nutrition. The organizer, industrialist Karl August Lingner (1861-1916), well known as the manufacturer of the popular mouthwash Odol, went on to found the German Hygiene Museum a year later. The museum sought to increase the public’s knowledge of health and health care. During the Nazi era, it was put in the service of racial “science.” Large portions of the museum grounds and exhibits were eventually destroyed in Allied bombing raids. Under the East German regime, the museum was once again used for public health education. In 1991, the Federal Republic of Germany granted the museum a renewed mandate in keeping with the founder’s original goals. Declared an historical preservation site, the museum underwent extensive renovation and reconstruction from 2001-2005. 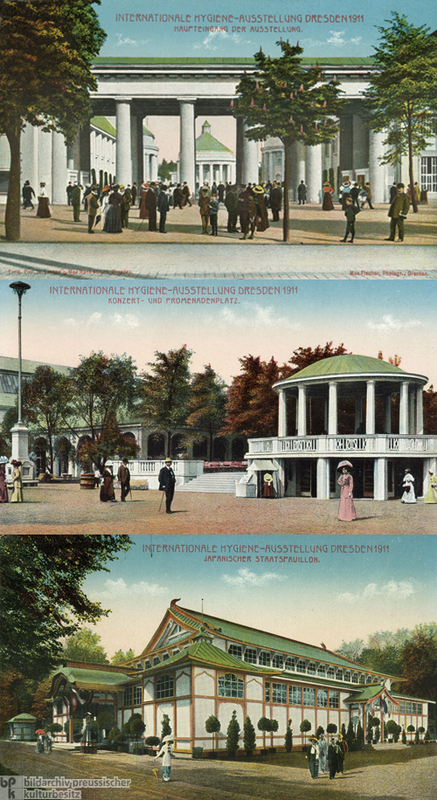 The postcards of the main entrance, concert area and promenade, and Japanese state pavilion suggest the importance of the exhibition with respect to contemporary German architecture. William Lossow (1852-1914), who was already well known for designing the main train terminal in Leipzig, was the exhibition’s lead architect. He was assisted by his son-in-law, Max Hans Kühne (1874-1942). Lossow was regarded by his contemporaries as a master of historicism who moved toward reform architecture after the turn of the century.